This article certainly succeeds in defying the local news stereotype. Obviously promoting the festival itself, it mentions the Social Model of Disability while highlighting the contribution of all the U.K.’s regions to the Disability Arts movement. It is free of the language and stereotypes often used by the press to describe disabled people or those living outside of the M25. Like many of the other events that are covered in material deposited into NDACA, Dadafest has played an important role in showcasing established and up-and-coming talent in the field of Disability Arts. Even a brief list of those who have been involved reads like a Who’s Who of Disability Arts and politics: Mandy Colleran, Dame Evelyn Glennie, Liz Carr, Mat Fraser, Laurence Clark, Aaron Williamson, Julie McNamara and Sir Bert Massie. NDACA holds programmes, posters and promotional material for every Dadafest so far, with the assumption that this Disability Arts event and others like it will continue to grow and develop in future. 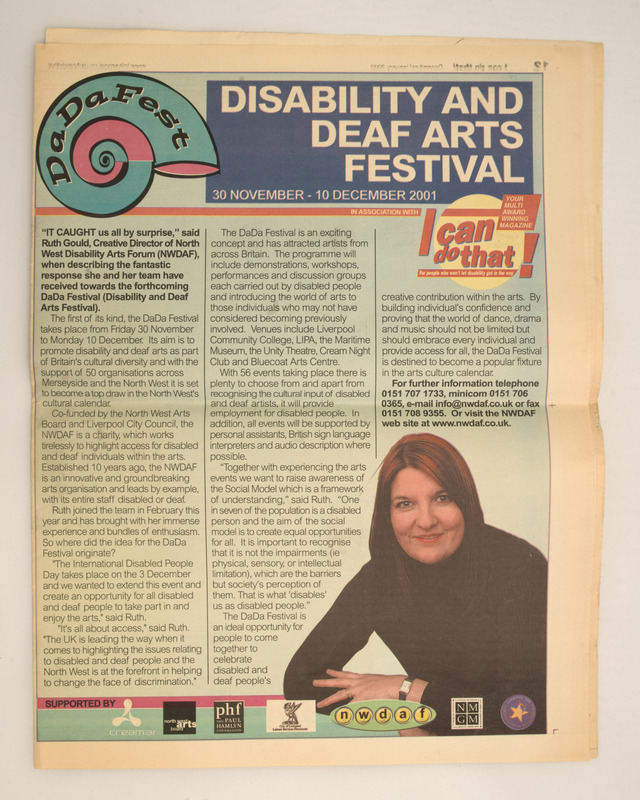 The many press cuttings held by NDACA cover a multitude of Disability Arts events, each one documenting this success and increasing visibility. For me, most importantly, having established Disability Arts as a movement in its own right, the article presents Dadafest as a legitimate part of arts and culture in the UK and internationally. From the very beginning Dadafest has drawn its audiences from communities, and rightly received local recognition for doing so. To me this is evidence of the strength of disability arts: while they represent and express a particular kind of individual experience they also achieve a wider resonance with many varied audiences.